Theresa May will meet Jeremy Corbyn later to see whether there is common ground to break the Brexit deadlock, Brexit Secretary Stephen Barclay says. He said the “remorseless logic” of MP numbers in the House of Commons meant the UK was heading for an “undesirable” soft Brexit – closer links with the EU. There were no preconditions for the talks, he said, but it was not a “blank cheque” either. Mr Corbyn says he wants a customs union and workers’ rights to be priorities. BBC political editor Emmanuel said there was not much difference between the government’s version of Brexit and Labour’s version, but there did not seem to be “an enormous amount of confidence” a political consensus could be reached from either party. 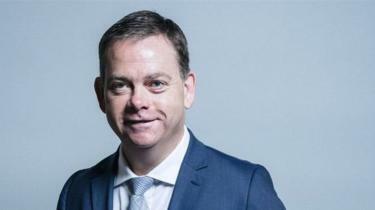 The PM’s move to hold talks has angered some Brexiteers, with Wales Minister Nigel Adams resigning his role. Mr Adams said the government was at risk of failing to deliver “the Brexit people voted for” and failing to prevent “the calamity of a Corbyn government”. Prominent Brexiteer Boris Johnson has accused Mrs May of “entrusting the final handling of Brexit to Labour”. And Jacob Rees-Mogg, leader of the Eurosceptic European Research Group (ERG) of Tory MPs, described the offer as “deeply unsatisfactory” and accused Mrs May of planning to collaborate with “a known Marxist”. But Mr Barclay blamed hard Brexiteers in the ERG who refused to back the PM’s deal. He told BBC Radio 4’s Today programme: “It’s regrettable that what we have been saying for several months now is coming to pass but that is the remorseless logic of not backing the prime minister’s deal. Mr Barclay said the consequence of MPs not passing the PM’s deal was either a “soft Brexit or no Brexit at all”. “It [a soft Brexit] is undesirable but it’s the remorseless logic of the numbers of the House of Commons,” he said. He said the EU has said the withdrawal agreement is the only deal available, but he said Labour had expressed more concern about the future relationship – which is contained within the separate political declaration. The withdrawal agreement includes how much money the UK must pay to the EU as a settlement, details of the transition period, and citizens’ rights – as well as the controversial Irish backstop that aims to avoid a hard border on the island of Ireland. The political declaration sets out proposals for how the UK’s long term future relationship with the EU will work after Brexit. Mrs May announced her plan to meet Mr Corbyn – as well as her intention to ask the EU for an extension to the Brexit deadline – after more than seven hours of talks with her cabinet on Tuesday. Mr Corbyn said he was “very happy” to meet Mrs May and recognised his own “responsibility” to try to break the deadlock. But the meeting is not expected to take place before this afternoon, at the earliest, says our political editor, who was told by Mr Corbyn’s team that he was not available on Wednesday morning for talks with the PM. If passed into law, the bill – presented by Labour MP Yvette Cooper – would require the PM to ask for an extension of Article 50 beyond that deadline. Mrs May said she wanted to agree a new plan with Mr Corbyn and put it to a vote in the Commons before 10 April – when the EU will hold an emergency summit on Brexit. 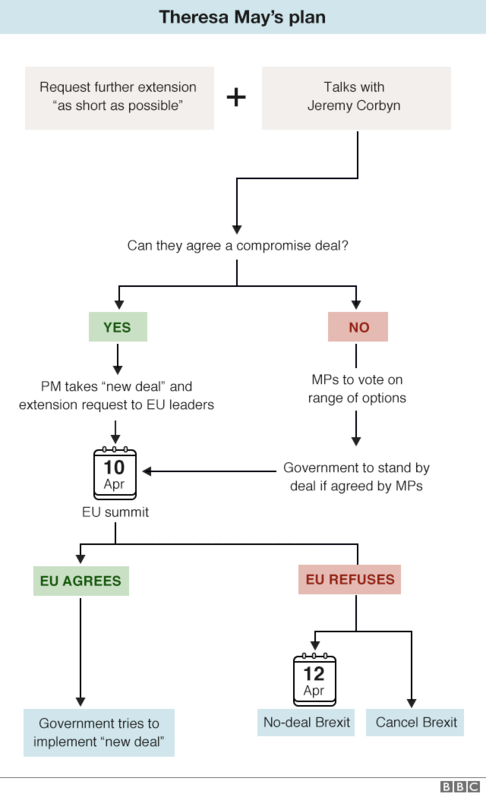 If there is no agreement, Mrs May said a number of options would be put to MPs “to determine which course to pursue”. European Parliament Brexit co-ordinator Guy Verhofstadt, who has previously said he thought a no-deal Brexit was “nearly inevitable”, welcomed Mrs May’s offer of talks with Mr Corbyn. “Good that PM Theresa may is looking for a cross-party compromise. Better late than never,” he tweeted. She was for budging. The prime minister has made her priority leaving the EU with a deal, rather than the happy contentment of the Brexiteers in the Tory party. For so long, Theresa May has been derided by her rivals, inside and outside, for cleaving to the idea that she can get the country and her party through this process intact. But after her deal was defeated at the hands of Eurosceptics, in the words of one cabinet minister in the room during Tuesday’s marathon session, she tried delivering Brexit with Tory votes – Tory Brexiteers said “No”. Now she’s going to try to deliver Brexit with Labour votes. In a way, it is as simple as that. Labour has previously said it has five tests for judging any final Brexit deal including protecting workers’ rights, establishing a permanent customs union with the EU and securing the same benefits of being in the single market the UK has currently. Shadow business secretary Rebecca Long-Bailey told the Today programme that Labour was approaching the conversations with “an open mind”. After Mrs May’s statement, the president of the European Council, Donald Tusk, called for patience. European leaders have been intensifying plans to cope with a possible no-deal, particularly surrounding the border between Northern Ireland and the Republic of Ireland.